A rich, spicy white cheese dip. 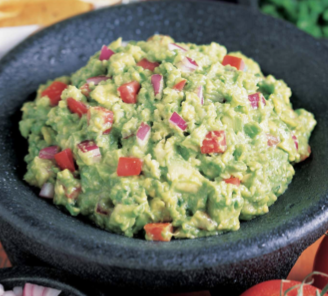 Served with flour tortillas fresh from our kitchen, grilled onions, peppers, tomatoes, rice, frijoles rancheros, pico de gallo, sour cream, and choice of guacamole or cheddar cheese. Bean and cheese nachos topped with grilled fajita steak. Served with guacamole sour cream dip. Chili con queso with spicy taco meat, pico de gallo, and diced tomatoes. Bean and cheese nachos topped with grilled fajita chicken. Served with guacamole sour cream dip. It is so grand! Steak tacos al carbon, spicy beef quesadillas, chicken & beef crispy mini-tacos and fajita chicken & bacon nachos. With queso & cilantro jalapeño dip. Chicken, corn, black beans, tomatoes, cilantro, and cheddar on salad greens with sesame-chipotle dressing. Circled by cheese quesadillas. Grilled chicken, crisp tortilla strips, avocado & jack cheese. 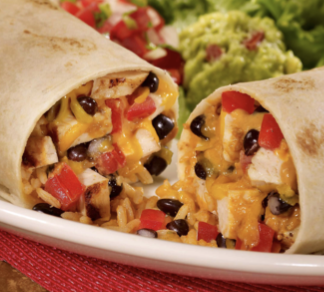 Fajitas are served with flour tortillas fresh from our kitchen, grilled onions, peppers, tomatoes, rice, frijoles rancheros, pico de gallo, sour cream, and choice of guacamole or cheddar cheese. Grilled chicken breast with onions, mushrooms, peppers, pico de gallo & jack cheese. With rice & sautéed vegetables. 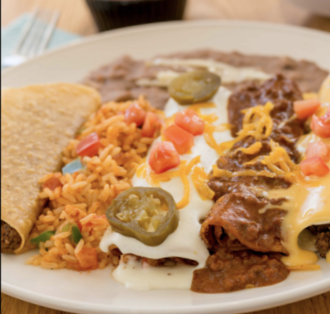 Since 1940, our signature enchiladas are prepared & carefully hand-rolled fresh for you. Spicy beef with chili con carne, cheese & onion with chili con carne, spinach with sour cream sauce or chicken with sour cream sauce. With rice & refried beans. 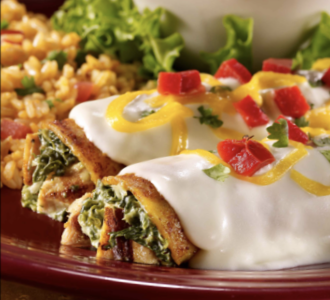 Grilled diced chicken breast with creamy spinach in enchiladas topped with sour cream sauce, cheddar, roasted red peppers & cilantro. Served with rice & black beans. 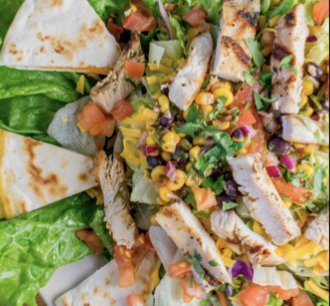 With fajita chicken & jack cheese, topped with pico de gallo, sour cream sauce, chipotle drizzle, lettuce & tortilla strips. With rice & frijoles rancheros. Two cheese & onion enchiladas on sautéed onions & green peppers with grilled fajita steak & ranchera sauce or grilled fajita chicken & sour cream sauce. With rice & refried beans. Fresh avocado, mushrooms, poblano pepper & jack in corn tortillas, topped with verde sauce, cilantro & sour cream drizzle. On spinach with rice & frijoles rancheros. Crispy bacon, fajita chicken and fresh mushrooms in corn tortillas with jack cheese. Topped with sour cream sauce & a chipotle drizzle. With rice & frijoles rancheros. Five mini-enchiladas! Avocado, cheese, bean, chicken & beef mini-enchiladas all on one plate. With refried beans & rice. Spicy beef burrito with chili con queso, chicken enchilada with sour cream sauce, cheese & onion enchilada with chili con carne, & a crispy chicken taco. With rice & refried beans. Cheese & onion enchilada with chili con carne, soft cheese taco with chili con queso, & a crispy beef taco. With rice & beans. Two beef burritos, one topped with queso & the other with sour cream sauce. With an Old Fashioned Beef Taco, rice & frijoles rancheros. Three beef tamales topped with chile con carne, cheddar & onions. With guacamole, pico de gallo, rice & refried beans. Spicy beef, refried beans, chili & cheese topped with chili con queso. With rice & refried beans. Flour tortilla with spicy beef and topped with chili con queso. With rice & refried beans. Crispy flour tortilla filled with chicken, jack & cheddar, sour cream sauce & pico de gallo. With a chipotle drizzle, chili con queso, rice & refried beans. Chicken Fajita with pico de gallo, avocado, cilantro & cotija cheese with chipotle drizzle. Served with rice & choice of beans. Spicy casacabel sauce, marinated onions, cilantro & cotija cheese. Served with rice and your choice of beans. Spicy casacabel sauce, marinated onions, cilantro & cotija cheese. Pulled pork with jack, cotija cheese, chipotle wine sauce, grilled onions & cilantro. Served with rice & your choice of beans. Pulled pork with jack, cotija cheese, chipotle wine sauce, grilled onions & cilantro. Steak Fajita with pico de gallo, avocado, cilantro, cotija cheese & sour cream drizzle. Served with rice & your choice of beans. Steak Fajita with pico de gallo, avocado, cilantro, cotija cheese & sour cream drizzle. 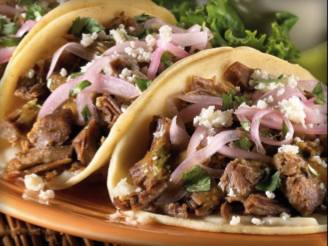 Brisket with pickled red onions, cilantro, jack cheese & cotija cheese. Served with rice & your choice of beans. Shrimp with jack cheese, jalapeño cole slaw, cotija cheese & chipotle drizzle. Served with rice & your choice of beans. Shrimp with jack cheese, jalapeño cole slaw, cotija cheese & chipotle drizzle. 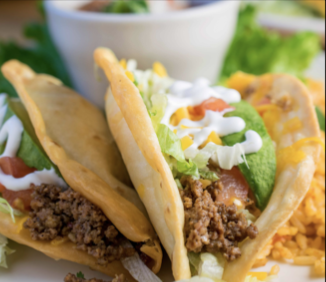 Crispy corn, soft flour tortillas, or puffy taco with lettuce, tomatoes, cheddar & your choice of spicy beef or chicken. With rice & refried beans. Two crisp flour tortillas filled with chicken or beef taco meat, jalapeños, lettuce, cheddar, tomatoes, sour cream drizzle & avocado. With rice & frijoles rancheros. With Mexican brandy butter sauce. Cheese & onion enchilada with chili con carne & a soft cheese taco with chili con queso. With rice & refried beans. Chicken enchilada with sour cream sauce & crispy chicken taco. With rice & refried beans. Flour tortilla with spicy beef topped with chili con queso. With rice & refried beans. Chicken enchilada with sour cream sauce. With rice & refried beans. 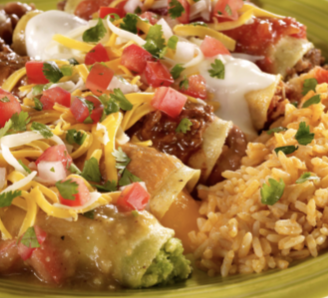 Cheese chimichanga with chili con queso or beef & bean chimichanga with chili con carne. With rice & refried beans. 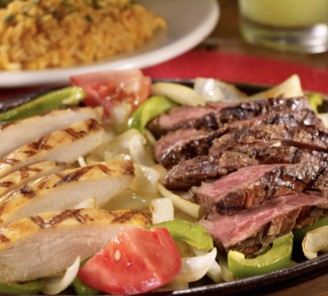 Lunch portion of our fajitas on a sizzling skillet with onions, green peppers, tomatoes, rice, refried beans, pico de gallo, sour cream, flour tortillas & guacamole or cheddar cheese. Lunch portion of our fajitas on a sizzling skillet with onions, green peppers, tomatoes, rice, refried beans, pico de gallo, sour cream, flour tortillas & guacamole or cheddar. Two crisp flour tortillas filled with chicken or beef taco meat, lettuce, cheddar cheese, tomatoes, sour cream & avocado. With rice & frijoles rancheros. Grilled chicken breast with onions, mushrooms, green peppers & jack cheese. With pico de gallo, rice & sautéed vegetables. Choice of fajita chicken or pork fried crispy with chipotle wine sauce or fajita beef with chili con queso. With beans, diablo corn, rice, cheddar & jack cheeses, onions, peppers & tomatoes. Topped with sour cream drizzle & cilantro.